Above, is the quilt top I made out of Heather Bailey freshcut fabrics from the "Hip Baby" pattern I found at a quilt store when I was in UT for a friend's wedding this past fall. It was A LOT of cutting (probably the first quilt I have ever made that wasn't "strip" piecing) but it was pretty easy. 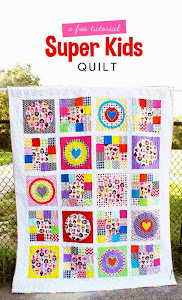 I am going to save my pennies to get this longarmed because I am too proud of it to ruin it with my very poor machine quilting skills (or lack thereof). I made these two purses yesterday, same pattern of the one I made my sister for Christmas. Can you notice the difference between the two? (The one on the right has a shorter lip than the first). Which one do you like better? The fabric is Heather Bailey's Pop Garden- a kind and generous gift from my hubby. I know, I know. I have been making a lot of purses lately but I cannot help it. 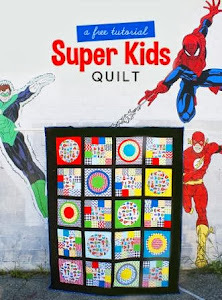 They are so fun and a lot more sewing than cutting (hello quilts!). a. they are few and far between (the closest one to me, that doesn't sell 'country' fabrics, is a good 45 minutes away. c. if they by a very small chance, happen to carry the brands/designs I prefer, it is usually in the least attracive color pallette because they get so picked over. I really liked making this bag and have to say I am pretty happy with the way it turned out. Th only problem is that the fabric is so light in color- I will probably use it sparingly in order to prevent it getting really dirty. I will at least wait till spring- given all these constant winter storms we've been having. The hardest thing was doing the pleats on the exterior- but it definitely adds a lot to the look of the bag. I really liked the tutorial- it taught me some valuable things when it comes to making a purse. You can't really tell from the pictures, but this bag has some serious structure, thanks to 2 layers of interfacing and 1 layer of cotton flannel to reinforce the bag. Hope everyone had a good Christmas and New Year's. My husband graciously gave me lots of fabric for Christmas- but I will try to refrain from more fabric pictures and show you some of my latest projects. I have been sewing up a storm on this snowy weekend. I am working on a baby quilt today and I am cruising right along. I find it REALLY hard to stop doing a project I am in the middle of- but I needed to take a break. So I am posting a couple of posts from crafts from the holidays- those will appear this week. In the meantime, I made these last night for Heather, one of my coworker's, for her birthday that is coming up this week. On the left is a "cash-less wallet." I think next time I make this, I will make it wider in order to fit business cards more easily. The pattern is from, you guessed it, Bend the Rules. On the right is a coffee cozy from a free tutorial on I found online here. I still need to test it on a cup to see if it will fit right.